NIEHS and National Toxicology Program (NTP) Director Linda Birnbaum, Ph.D., is the recipient of the 2016 Dr. Phillip L. Smith Award from the Native Research Network (NRN). The award was presented June 8 at the 26th Native Health Research Conference in Cherokee, North Carolina. The network recognized Birnbaum, who had already become a Treasured Friend of the NRN, for exemplary federal support for Native American health research. The award was accepted on her behalf by Symma Finn, Ph.D., NIEHS health scientist administrator and a member of the NRN federal committee who helped plan the meeting. Finn moderated a plenary talk titled, “The Effects of Climate Change on Native Communities” and organized a session of NIEHS grantees featuring Jada Brooks, Ph.D., from the University of North Carolina at Chapel Hill (UNC); Karletta Chief, Ph.D., from the University of Arizona (UA); and Tommy Rock, Ph.D., from Northern Arizona University. NIEHS postbaccalaureate fellow Trey Saddler presented a poster, “From Reservation to Researcher: A Tribal College Student’s Journey to Working for NIEHS Investigating Flame-retardants and Cancer.” Saddler, a graduate of Salish Kootenai College in Pablo, Montana, works in the NTP Molecular Pathogenesis Group, under the direction of Darlene Dixon, D.V.M., Ph.D.
Brooks, an assistant professor in the UNC School of Nursing and member of the Lumbee Tribe, presented “Better Child Asthma Control in Lumbee Indian Children.” The following week, she learned that she was awarded a five-year NIEHS grant to support mentored patient-oriented research and career development. 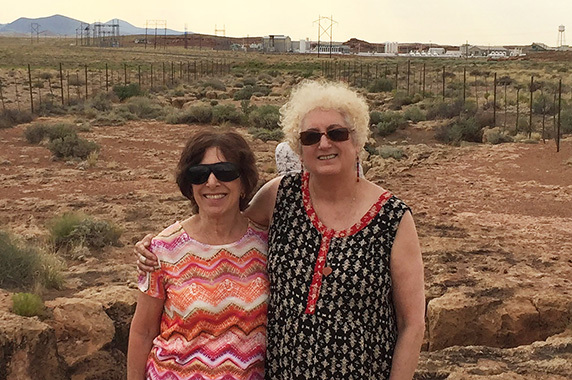 Later in June, Birnbaum and Finn attended the Tribal Environmental Health Summit, at Northern Arizona University in Flagstaff. On June 21, Birnbaum discussed the NIEHS commitment to addressing environmental health disparities on Native lands. Following her talk, Walter Phelps, a member of the Navajo National Council and the National Institutes of Health Tribal Consultation Advisory Committee, led a tour to local destinations, including a farm and the Tuba City Regional Health Care and Navajo Hopi Health Foundation. They also visited a Native charter school run totally on solar power. Many students at the school participated in Successful Transition and Academic Readiness, a summer program run by Northern Arizona University to ensure new freshmen make a successful transition from high school into college. The back-to-back summits were an opportunity for NIEHS to highlight its work on Native health issues and to draw attention to the work of a rising generation of Native American health scientists. “It’s heartening to see that health research is increasingly being conducted by tribal academics,” said Finn. NIEHS grantees participated in each conference, and several were at both — Chief, assistant professor at UA and a researcher with the UA Superfund Research Program Center; Jamie Donatuto, Ph.D., an environmental health analyst at the Swinomish Indian Tribal Community; and Jani Ingram, Ph.D., an associate professor at Northern Arizona University and the principal organizer of the Flagstaff summit. next article - "Plan to replace animal ..."